A redevelopment area generates funding to implement a redevelopment plan when the total taxable value of an area is above the first year it was established (base year). Dunbar/Michigan was established at the peak of the real estate boom of the early 2000's. Being 65% below base year value it will be many years before the redevelopment area generates revenue. Therefore, the CRA is "sunsetting" the redevelopment area, or legally ending it. The CRA wants to see redevelopment activity occur. In establishing a redevelopment area, Florida law requires a Finding of Necessity to be prepared. This study supports that there is a need to implement the redevelopment area and generate tax increment financing (revenue generated in redevelopment areas). A Finding of Necessity was completed and continues to support a need for redevelopment. This was unanimously approved by the CRA Commission. Florida law allows for the expansion of existing redevelopment areas. Surrounded on the north and south by Dunbar/Michigan, it makes redevelopment sense for the overall area to fall within one redevelopment area and plan. The "new" or "expansion" area is included in the existing total value based on it's current value. Therefore, the "expansion" area will no longer be in a deficit or negative value provided real estate values do not decline. Assuming property values continue to increase, the "expansion" area will begin to generate revenue to undertake redevelopment plan elements. To be in accordance with Florida law, a redevelopment plan is required to be prepared and approved to be able to spend tax increment revenue. These funds can only be spent on items or elements included in the plan. The CRA intends on updating the existing plan to include the "expansion" area. This will allow the CRA to begin working on redevelopment projects. Action Step 1 – Western Gateway: encourage redevelopment of the southeast corner of Cranford Avenue and Dr. Martin Luther King, Jr. Boulevard to link McCollum Hall with the Imaginarium, design a landscaped gateway to Dunbar immediately east of Cranford Avenue, encourage a joint venture with McCollum Hall. See plan page 5.3. Status; ongoing. Action Step 2 – Clemente Park and Dunbar Park; completion of land acquisition, building demolition and building of the park. See plan page 5.8. Status; completed. Action Step 3 – Business lots damaged by four-laning of MLK;create an overlay district to waive unnecessarily dimensional restrictions on small business blocks, minimum parking requirements did not apply, reconstruct side streets to provide on-street parking. See plan page 5.10. Status; adopted by Ordinance No. 3727 on January 5, 2015. Action Step 4 – Southwest Florida Enterprise Center; expand the number and variety of local businesses, continue to support and publicize the entrepreneurial assistance offered by the SWFEC, FGCU Small Business Development Center and training at the High-Tech Center - completed. See plan page 5.12. Status; ongoing. Action Step 5 – Michigan Court; reconstruct Michigan Court on a network of traditional streets and blocks - completed. See plan page 5.14. Status; completed. Action Step 6 – Eastwood Village; construct a variety of of market-rate and workforce housing products on traditional interconnected blocks, and it must accommodate the extension of Hanson Street to Ortiz and allow Edison Avenue to flow through the property. See plan page 5.18. Status; Phase I has been transferred to development. Action Step 7 – Mid-Town Dunbar; develop a prominent cultural landmark at the intersection of MLK and Veronica S. Shoemaker Boulevard with dignified housing nearby. See plan page 5.21. Status; ongoing. Mt. Olive will be constructing a new sanctuary on this site..
Action Step 8 – Veronica S. Shoemaker Boulevard Drainage Canal; develop alternative that will provide greater cleansing of stormwater flowing toward Billy Creek while also improving safety for children or pedestrians. See plan page 5.23. Status; tbd. Action Step 9 - Terry Park & Shady Oaks Park; improve access to both parks. See plan page 5.25. Status; tbd. Action Step 10 - Constraints on New Houses; modify city code to allow one single-family home to be built on a 50' wide vacant lots. See plan page 6.2. Status; adopted by Ordinance No. 3422 on January 14, 2008. Action Step 11 - Infill Housing Standards; accelerate converting abandoned lots to affordable housing, modify standards to support innovating housing technologies, reconsider standards for paved driveway widths, garages and professional landscaping, look to alternative to minimum size houses. See plan page 6.3. Status; ongoing. Action Step 12 - Towles Garden Affordable Housing; commit to developing Towles Garden site for affordable housing with diverse housing types placed on traditional city blocks. See plan page 6.4. Status; currently active. Action Step 13 - Junkyard Removal; automotive junkyard near Franklin Park elementary School blight the surrounding residential neighborhood, and should be relocated to a suitable industrial site and replaced with housing that improves the neighborhood. Add these junkyards to the list of "existing junkyards" in the Growth Management Code to prohibit expansion and allow relocation to a suitable district. Following Towles Garden housing development, the CRA should develop housing on these sites. See plan page 6.6. Status; currently active. Action Step 14 - Enterprise Zone Marketing; aggressive marketing is needed to support job opportunities and affordable housing. See plan page 6.7. Status; Florida Enterprise Zone Program expired on December 31, 2015. Action Step 15 - Dunbar/Michigan Avenue Redevelopment; a new Dunbar/Michigan Avenue redevelopment area should be established. See plan page 6.10. Status; established in 2007. Action Step 16 - Dunbar Development Fund; economic revitalization is more important than physical revitalization. A Dunbar Development Fund could coordinate training and financial assistance to local entrepreneurs, understanding that the untapped economic potential from its own residents, tourism and key location exists. See plan page 6.13. Status; tbd. Action Step 17 - Overly Rigid Land-Use Controls; city must transform outdated land-use regulatory stem to allow the city to improve over time. See plan page 6.14. Status; adopted by Ordinance No. 3727 on January 5, 2015. Action Step 18 - Design Standards for Duplexes; duplexes can provide more variety in housing but can be problematic when built in single family neighborhoods. Strict design standards should be developed to resolve this incompatibility. See plan page B.15. Status; adopted by Ordinance No. 3727 on January 5, 2015. Action Step 19 - Tree Replacement; rows of street trees should be planted between sidewalks and traffic lanes for safety and attractiveness. See plan page C.3. Status; adopted by Ordinance No. 3727 on January 5, 2015. Several redevelopment areas exist within the general MLK/Dunbar/Michigan area. There has also been significant annexation from Lee County in 2003 to enable the city to plan for redevelopment. 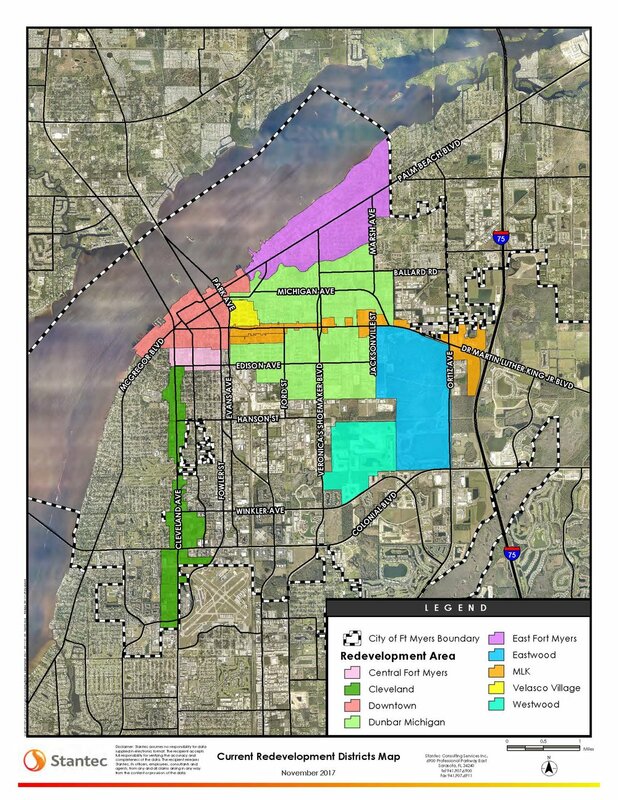 Existing redevelopment area boundaries impacted by the MLK Expansion. All colored areas (yellow, green, blue, and orange) are within the expansion area. All areas included within the expansion area are currently designated redevelopment areas. 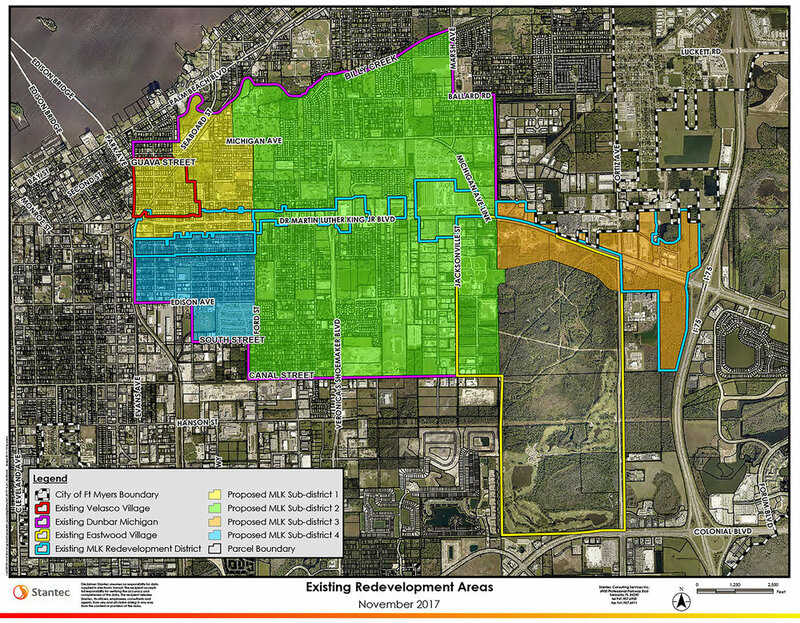 As proposed the there is minimal modification to the redevelopment areas, and no areas that are not currently included within a redevelopment area have been added.